The foremost title line -- "The Holy Family" -- was added at the suggestion of the book publisher Lowenthal. It's a sarcastic reference to the Bauer brothers and their supporters. Bruno Bauer attempted to rebut the book in the article "Charakteristik Ludwig Feuerbachs" -- which was published in Wigand's Vierteljahrsschrift, Leipzig 1845. Bauer essentially claimed that Marx and Engels misunderstood what he was really saying. Marx would reply to that article with his own article -- published in the journal Gesellschaftsspiegel, Elberfeld, January 1846. And the matter was also discussed in chapter 2 of The German Ideology. ONLINE EDITION: Written between September and November 1844, this book was first published in February 1845, Frankfurt am Main. The work was never translated into English in either man's lifetime. This 1956 English translation is by Richard Dixon and Clement Dutts and is taken from the 1845 German edition. It is transcribed for the MEIA by Peter Byrne, 1997. Hey, I've been hunting around for a reference to Proudhon's "What is Property?" in here, and it's supposed to be in Chapter 4, the same one that's missing. Any idea what that is? Thanks. I'm really confused about the formulation of this piece, though. What do they mean by "Critical Criticism as X"? 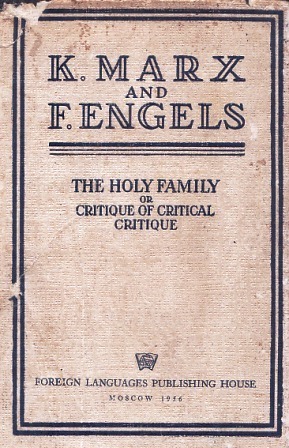 With "critical criticism" Marx and Engels means the Hegelian ideas popular among intellectuals at the time. So "Critical Criticism as Herr Bruno" would mean these ideas as expressed by Bruno Bauer. Chapter 4 is basically Marx criticizing Edgar Bauer for misrepresenting and mistranslating Proudhon. Thanks. Kind of funny that he'd go to all that trouble, only to attack Proudhon later with a whole polemic, though, isn't it?